I was looking through the Pace 2009 budget. 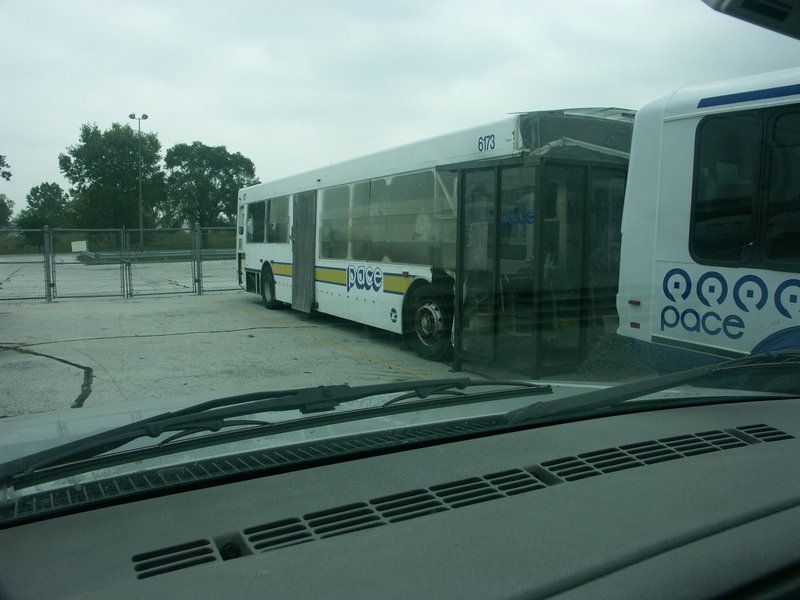 37 30' buses and 128 Paratransit vehicles were included in the 2009 budget. I would imagine the ones we are seeing arriving at present are part of the 37. This would explain why they have apparently arrived so soon after the stimulus money was received and also are not marked as stimulus vehicles! There was also the May Finance Committee report that they reprogrammed capital money to buying 16 OTRs. Also not sure how that figures in, as one might think that a hybrid OTR would be in the $600K range, while an ElDo is in the $300K area. Also, in the paratransit area, I have seen fleet numbers in the 5300s, while before the highest number (in the small paratransit series) was in the 5120s, which concurs with your sightings (or at least indicates that Pace has received over 170 so far this year). Pace is selling off 108, which comprise most, but not all, of those with yellow stripes. Hence, there is no way of really telling (at least from public sources at the moment). Reading the May finance notes it looks like it is up to 58(37+21) for the 30' (2742-2799) and up to 190(128+62) for the paratransit vehicles and then reprogramming for up to 16 OTR. From the 2008 budget there was 80 paratransit vehicles and 48 community vehicles which did start arriving in the second half of last year. I estimated this would take the short paratransit series (5000-5127) from 5128 to 5256 (the earliest I have seen is 5131 and the latest 5251 in this series). I have not seen anything that indicates they have taken the long paratransit series (5500-5891) further. I also have seen vehicles numbered above 5256 (this year) and if they just run the 190 on this would take it from 5257 to 5458. But as you say we will have to see! 2742 finally "virtually" appeared. I was starting to think that it was a permanent gap in the fleet number order. And #6628 (assuming a former Joliet bus) is now at West. I saw it on route #322 today. That went over as part of the Will County restructuring, when West also got 6627 and 6680. Noted on March 9th. Officially 2742-2752 are in Joliet with more to come I'm sure. They still have 6626, 6667, 6670, 6672, 6673, 6674, 6675 to get rid of for sure so as soon as one of those buses show up somewhere else, we'll all know. I took an unexpected trip to South Holland Pace today (got lost looking for a grocery store...lol) and boy oh boy did I see a lot. Maybe I'm more excited than the die hard bus fans on here, I don't know. Anyway, in regards to this thread, there are 2758-2765 Eldos at least, waiting to be put on the road. There were more than that, but I didn't get a chance to see all the numbers. BTW, I saw 6673 there also, didn't know that bus was already moved there from Joliet so I'd there's only a handful of Joliet Nabis to go. Wonder why? West shouldn't need any more buses. To reiterate, when the 2003 NABIs arrived, W sent 8 Orion VIs to NW (6029-6036), and S sent all of its 29 Orion VIs (6116-6144) to NW. There was no apparent need to do either. It hasn't happened yet, and I'm not assuring that it does, but there is precedent for it again happening. I remember South having Orions IVs once upon a time, I remember seeing one at River Oaks one time. So could it be possible that West gets the rest of the 35-foot Nabis from Joliet once all the Eldos are in and more Orions head NW to take out some of those Orions? Eldo #2753 is on the 832 today on Webwatch. 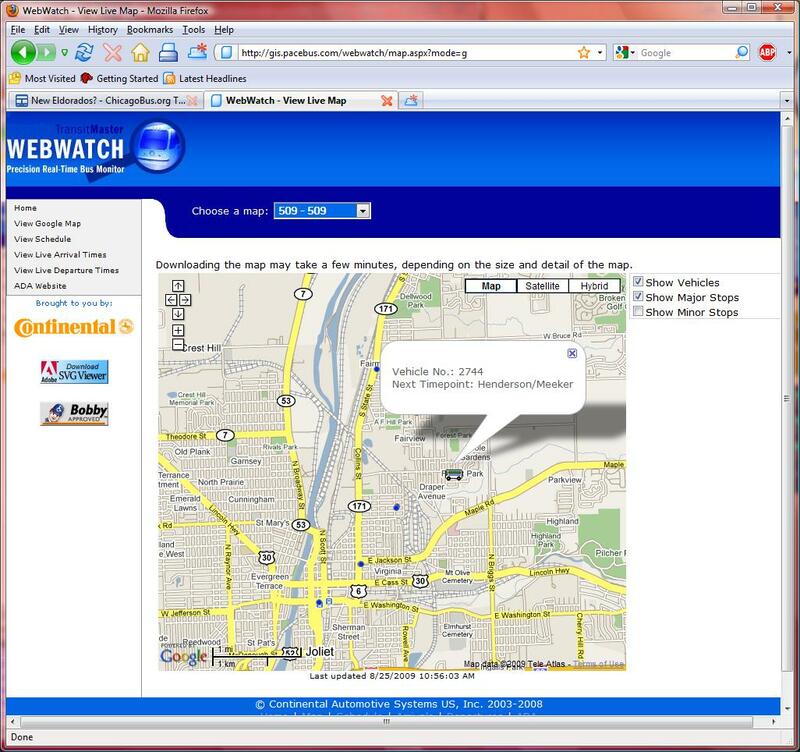 I wish I knew how to post the info from Webwatch on here. And Nabi #6671 is up north now, today running route #581. It looks like both #6114 & #6115 appear to have been moved to NW; I didn't understand why west got those buses from SW anyway, they seemed so out of place. 6115 is on route 209 today and 6114 is on route 208 according to Webwatch. So NS and NW probably will get some Orions from West, maybe more once all the Joliet Nabis head West. ...So NS and NW probably will get some Orions from West, maybe more once all the Joliet Nabis head West. NS probably won't get any Orion VIs, because it never had any and doesn't need any more big buses. Also, I'm surprised WebWatch is back up, as it was dead most of the week, but at the moment it is working again. 6115 is on the 208 and 6114 is on the 270 today. Eldo #2754 is out today on route 501. It probably replaced Nabi 6671, which went North. I only know of Nabis 6626, 6670, 6674, and 6675 still in Joliet now. Very unlikely since 6671 went North 5 weeks ago. You have to keep up with developments. 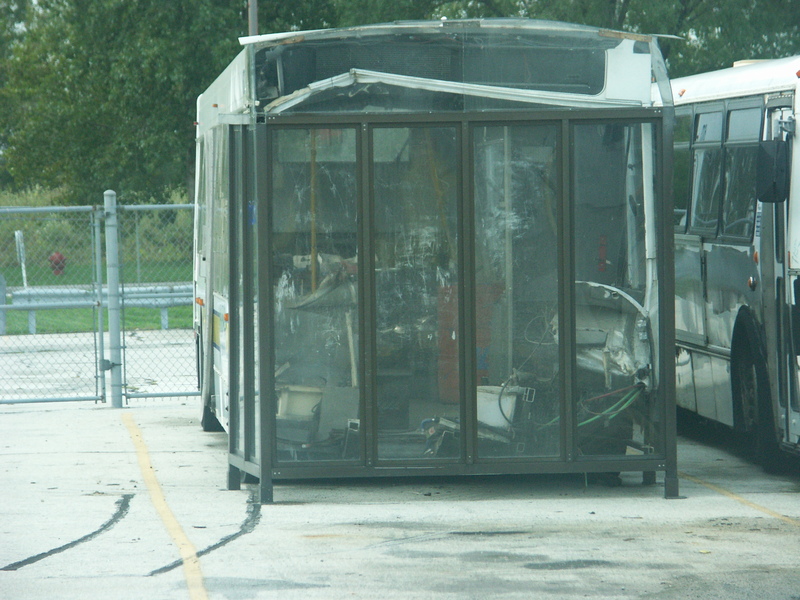 Both NABIS(6672&6673)inside South Holland are headed to the West garage in Melrose Park. And sure enough, 6672 is out today on route 307. I didn't see 6673 on Webwatch, but I'm sure it's out West by now & will show up at some point. UPDATE: 6673 is on route 320 today 10/2/09. 6037 is now at the northwest division. It's on route 221 right now. Sounds like Busjack's prediction may be dead on about some Orion IV's heading from West to NW. Don't be surprised if you see 6038-6041 at least heading up there in the next week or so. 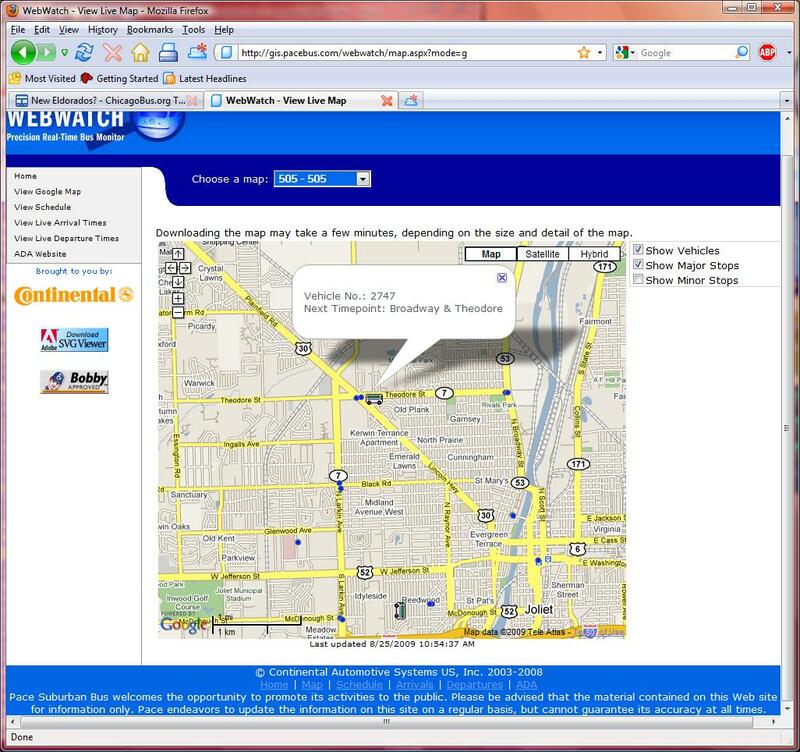 Well look at Webwatch today. Eldo 2758 is on the 834 today. That tells me that 2755-2757 must be out there also. 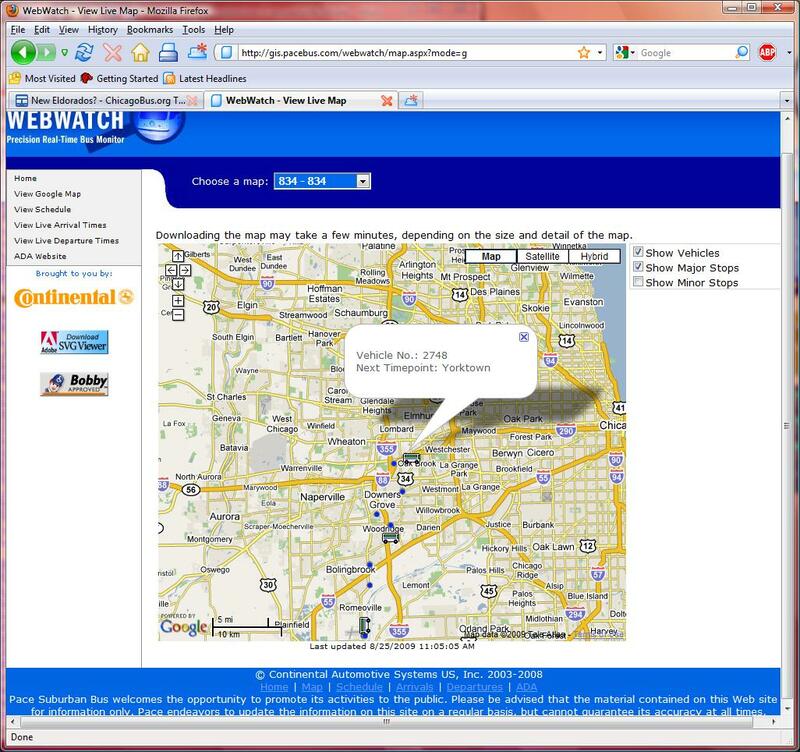 I really hate that Webwatch can't show all the route in Joliet so we could see a clear picture. I give it less than a week, the rest of the 35 foot Nabis will be either West or South. That's 6173, which has been there for several years now. The first time those of us who don't work for Pace have seen it from the front. A driver from South said that it hit a truck on I-94 when the bus driver fell asleep at the wheel. References: Buses that u wont see on the road; fell asleep. Here is a closer shot of 6173,but the shelter blocks any good view of the interior.